Schedule your employee shifts faster and smarter with our powerful and highly effective yet easy-to-use Staff Scheduling Software. Automatically create clear (error-free) schedules, import staff schedules of your choice, copy shifts and so much more. Let your staff members set the availability and deal with business management. Managers are conserving up to 85% of the time formerly spent arranging by sharing staff scheduling duties. Whether you're dragging a staff member onto a predefined shift or moving your desired shift to a completely new date - all these tasks in our online software are interactive and visual, meaning you can save a lot of time handling the work schedule and more time on your own business. Our staff scheduler updates instantly, meaning that you will save even more time. Our system will also show you weekly, daily or hourly period that is under and overstaffed - all in real time. Keep all your schedules up to date so you can refer them on the go with Eworks Managers tablet & mobile applications - with our support for all smart devices including iPhone, iPad, Android tablets, Blackberry & smartphones. Eradicate work schedule attendance excuses and related things. 24/7 having access to staff schedules & shift flexibilities combined with reminder emails & SMS give employees fewer chance to ignore/misread or forget about shifts. Prevent staff schedule conflicts easily with up to date employee accessibility information and instantly view and correct any clashes due to shifts overlapping, unavailability, overtime, and the list goes on. Eworks Managers web-based App allows you to access the employee schedule how you desire. You can select from different views including day-to-day, every week, and month to month in a visual list. Built-in position & location structures allow the freedom to properly set up your accounts just the method that you need. Whether you have multiple locations or departments or a single position, Our staff scheduler can be customised to meet your needs. Keep your employee schedule up to date even on the go. 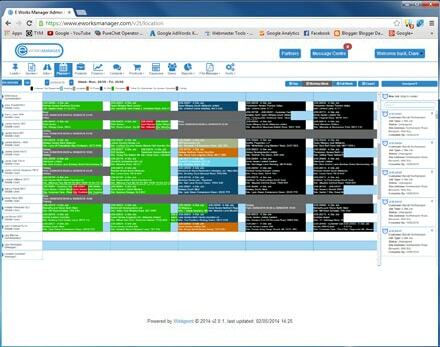 Our software can be integrated with 3rd party Apps such as Outlook and Google Calendar. Automatically create clear, error-free employee shift schedules on the go. Once you are finished you have the chance to review & make any essential changes prior to publishing your schedule. Easily create multiple personnel schedules with unique settings for each of your work teams within your company. Have several departments in your organization that handles different schedules? Not a problem - with Eworks Manager you can allow individual staff members access to whatever schedules they need.